Limited Resources. Tight Deadlines. How can you optimize your business processes? Get the answers with Simio. J. Spencer Williams, CEO at Retirement Clearinghouse, needed to crunch some numbers. He turned to his trusty spreadsheets, but this problem was so complex that a spreadsheet couldn’t do the job. So he tried a less common approach: he used Simio discrete event simulation -- software more likely to be found in an engineering department. He used the Simio model to evaluate the industry as a whole. 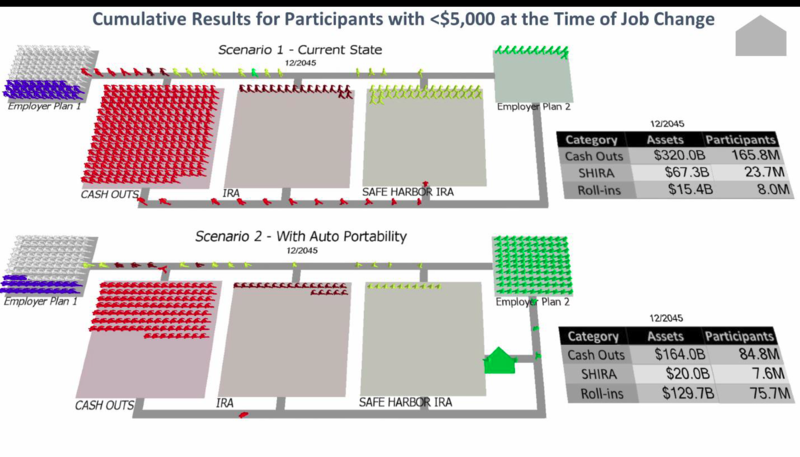 At a EBRI Policy Forum, the simulation was presented and showed how widespread adoption of seamless plan-to-plan transfers for small-balance accounts can significantly increase Americans' retirement prospects by retaining more savings in employer-sponsored plans. If auto portability is widely adopted, within one generation small cash-outs could be reduced by two-thirds, from $7 billion annually to less than $2.5 billion annually. As a result, auto portability could generate more than $115 billion in new employer-plan savings for the current and next generation of plan participants. Read the Full Case! Cost savings and/or cost avoidance in a typical simulation project are often 10 to 20 times the initial investment within four to six months of initial use. Any process that needs optimized. Simio works with processes across to answer the "what ifs" and optimize the process without expensive capital expenditures. $115 Billion 401K Boost Predicted with Simio Process Model. Click here to read the entire case study.